The following is a reference / historical listing of the 70-millimeter presentations of “Blue Thunder” in North America. The film’s 70mm prints consisted of full-frame imagery blown up from anamorphic 35mm photography. The audio was Six-Track Dolby Stereo (“A” encoded “baby boom” format). These were arguably the best cinemas in which to experience this film. “Blue Thunder” was among thirteen confirmed first-run films released in 1983 with 70mm prints for selected engagements. The RASTAR-Gordon Carroll production and Columbia release — directed by John Badham and starring Roy Scheider, Warren Oates, Candy Clark, Daniel Stern and Malcolm McDowell — opened May 13th. Prior to the release of “Blue Thunder” there was a series of 70mm sneak preview screenings held in numerous locales. 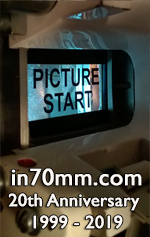 (Interestingly, many of the 70mm sneak preview screenings were held in markets that ultimately played the film only in 35mm upon its release.) As well, the film’s U.S. premiere was held April 13th at the Avco Center as the Opening Night feature of the Los Angeles International Film Exposition (FILMEX). Other pre-release screenings included an Invitational Preview held May 5th at the Samuel Goldwyn in Beverly Hills. A trailer for “Krull” circulated with the “Blue Thunder” prints and which the distributor recommended be screened with the presentation. Note that some of the presentations included in this listing were presented in 35mm during the latter week(s) of engagement due to print damage and the distributor’s unwillingness to supply a 70mm replacement print or because the booking was moved to a smaller, 35mm-only auditorium within a multiplex. As well, the reverse may have been true in some cases whereas a booking began with a 35mm print because the lab was unable to complete the 70mm print order in time for an opening-day delivery or the exhibitor negotiated a mid-run format switch to 70mm. In these cases, the 35mm portion of the engagement has been included in the duration figure.